One of my most treasured possessions is a doodle drawing given to me by my sister on my 45th birthday. 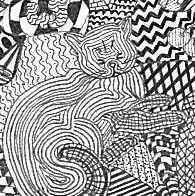 It has a lot of images partially hidden in a maze of curves and lines. This is a picture of that doodle (size reduced). You can see this is a clever way to put your artistic skills to good use. To start with, you need to make a list of things that are associated with the person you are making it for. When your list is finished, get a good piece of sketch paper and lightly sketch in each of the items, all over the page. Use curved lines, zigzags and some straight lines to section off each item. 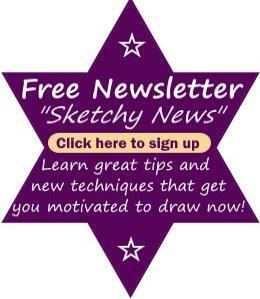 If you are happy with the way your sketches look, get your fine tip black felt pen and go over each outline. You need to use a contrasting design inside your sketch to the one you are using around it. You can use a thicker felt tip pen to color in larger bits (this also gives good contrast). In each section and around every item, use whatever pattern you like. You can have brickwork, stars, stippling, cross hatching, anything that you are inspired to use. Don''t forget to leave lots of white space! 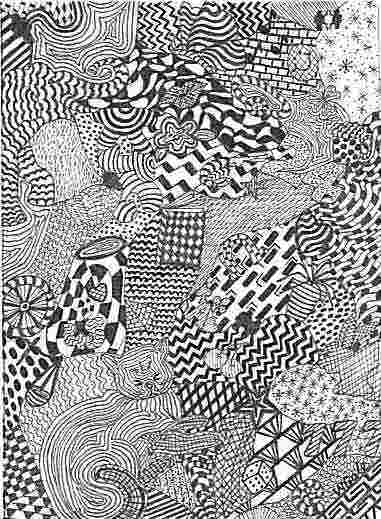 See if you can find the following symbols represented in the doodle drawing above. My family is very important to me so my sister drew little figures to represent each family member. They are scattered in groups throughout the doodle drawing and this group represents my 3 sisters. 24 for my date of birth. My lucky number and a horseshoe. My favorite food - see the cherries near the cat? I'm fascinated by pyramids and elephants. Ace of diamonds and hearts - I enjoy playing cards. 4 leaf clover - my sister and I used to spend hours combing the clover patches for a 4 leaf clover when we were kids. Imagine our delight when we found some -- they are still pressed inside of Mum's encyclopaedia! Libra scales - my star sign. A bunny - my affectionate name for my husband. I have always loved butterflies. Look at how cleverly the butterfly is interwoven. The list goes on, there are 36 items in total. Everything is pertaining to the person it is meant for - their likes, hobbies, interests and so on. My sister would never have dreamed how much this doodle means to me. It's entirely personal and I knew she had devoted her precious time to draw this just for me. My doodle drawing was presented in a nice white and gold frame and it's displayed proudly in my living room. I was given a list of symbols in a seperate, smaller frame so that I could search and identify them all. It took me a while to find all of the objects inside the doodle so it contains a 'fun' element as well. Every one of us has drawn doodles at some time or another so now you can play with doodling and end up with something you can use!